Review: Before I start, I’d like to mention that this review will make numerous references to pieces from both the Rozen Maiden (abbreviated RMOST) and the Rozen Maiden Träumend (abbreviated RMTOST) soundtracks, so it might be handy to have them at your disposal if you want to follow along. Granted, I understand that not everyone will have access to these, so I’ll try to describe the pieces as I go. The point of this exercise isn’t to admire “Balamb Garden ~ Ami’s” elegance (though it is a very beautiful piece), but it’s to show how an arrangement can blend two themes so seamlessly that it sounds complete rather than a piece that resulted when someone stitched two pieces together. I’d say that an arranger who seeks to do this should learn from Hamaguchi and consider which two pieces to combine and how to combine them to make the arrangement a solid, standalone piece. 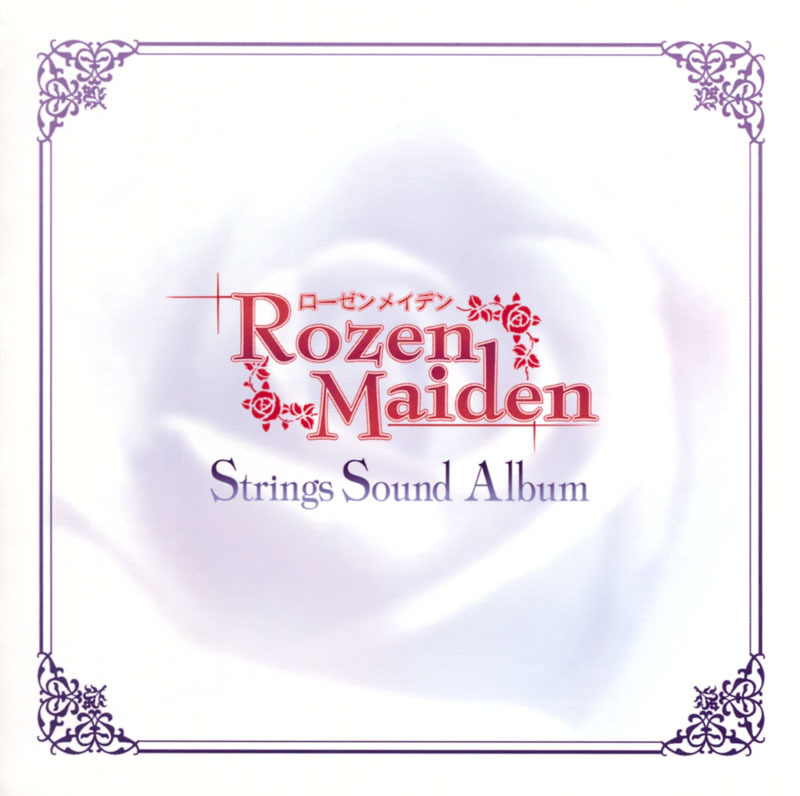 Based on the above objective, UbiQuinta’s efforts on the Rozen Maiden Strings Sound Album demonstrate that UbiQuinta has a ways to go before matching Shiro Hamaguchi’s skill at arranging music, but the gap isn’t as wide as before. While flaws like the abruptness of the transition from one theme to the next and the mixing of two incongruous themes in the same track do crop up in this album, they aren’t nearly as maddening as they were in the Piano Sound Album, making these flaws a slight annoyance rather than an outright distraction. Unfortunately, you’ll still have to bear with them and the first instance of this occurs in “Laplace no Ma,” which exhibits an abrupt transition as it goes from the “Destiny” (RMTOST) theme over to “Coward’s” (RMOST) theme at the 1:29 mark. Up until that point, the piece delivers a solid arrangement by keeping “Destiny’s” melancholy violin melody until “Coward’s” staccato rhythm makes its jarring entry because it’s stylistically different from “Destiny’s” rhythm. Luckily, from that point on, there’s little to complain about because the theme from “Laplace” (RMTOST) is so seamlessly blended into “Coward’s” midst that you won’t notice its presence unless you listen carefully. That is how the piece should have been executed all along and had that little hiccup not occurred from “Destiny” to “Coward,” we would have had an excellent, thematically consistent track on our hands. One cannot say the same for “Otome wa Tenshin Ranman’s” consistency because it does a poor job of combining its three themes. The piece begins the bouncy, upbeat melody from “Worrying Hobby” (RMOST) which is more enjoyable this time around through a variation on the theme while retaining the identifiable baseline harmony. The transition issue crops up after the pizzicato section where “Days of Agony’s” (RMOST) entry is atrocious because its funky, grim rhythm is at odds with “Worrying Hobby’s” general upbeat atmosphere. Once the piece segue’s into “Naïveté’s” (RMOST) more joyful, innocent-sounding melody, the transition sticks out slightly, but its inclusion gives this piece some structure that’s one can appreciate since the two tracks mesh well with each other since “Worrying Hobby” and “Naïveté” mesh well together. The good news is that “Laplace no Ma” and “Otome wa Tenshin Ranman” bear the brunt of my complaints, which speaks well for the rest of the album. To be fair though, UbiQuinta doesn’t make as many attempts at combining themes together, so the opportunities for messing up aren’t as numerous as it was in the Piano Sound Album. In any case, there’s plenty of variety to delight the listener. “Detective Kunkun” sticks to the cheesy, but enjoyable funky jazzy feel of the original, albeit with string instruments that makes for an interesting listening experience if you’ve never heard a violin play jazz. “Shun” and “Hitori” together demonstrate that UbiQuinta’s skill in arranging some of the more melancholy fare from the soundtrack. The former manages to bring out a feeling of loneliness and isolation through a dominating violin melody while the rest of the strings stay subtly in the background. “Hitori,” on the other hand stays true to “Lonely Heart’s” (RMOST) despondent melody while adding just a glimmer of hope here and there. And of course, people looking for more action-y tracks will be pleased with “Tatakai no Unmei,” which takes the violin and guitar vibes from “Old Adversary” (RMOST) and brings out the intensity of the fighting scenes in the anime. Finally, “Kibou wo Dai te’s” arrangement of “Towards Tomorrow” (RMTOST) offers a soothing melody that’s filled with optimism as to suggest that the characters will find a way to break the chains of fate that’s bound them to eternal warfare, making it a suitable piece with which to close out the BGM portion of this album. This album wouldn’t be complete without a violin version of the opening and ending themes to Rozen Maiden Träumend. Unlike in the Piano Sound Album the quality of the tracks are reversed. ALI PROJECT’s “Seishoujo Ryouiki” is better presented through a string quartet compared to “Kinjirareta Asobi’s” piano treatment because of the way the string quartet brings forth a sense of anxiety that the original piece exhibits. On the other hand, the arrangement of kukui’s “Hikari no Rasenritsu” results in a dull track because its attempt stays too true to the original, which robs it of the creativity it needs to stand on its own. Overall, Rozen Maiden Strings Sound Album represents a step up for UbiQuinta, who feels more comfortable dealing with the timbre that a string quartet offers over a solo piano. Had UbiQuinta been able to fix the issues that plagued the Piano Sound Album, this album would have become an instant favorite. While I have this lingering feeling that this was a missed opportunity to correct the deficiencies that existed in the piano album, those problems aren’t quite as virulent, making this disc one that’s worth your while, especially if you enjoy Rozen Maiden’s music or want to listen to a string quartet as a diversion from your usual repertoire. Huh, any chance you can direct me to an album containing such a remix? I’d be interested in hearing what they sound like knowing ALI Project’s propensity to use music from classical sources. Sure, can I send you links to webmaster@animeinstrumentality.net? Or do you want me to use another email address? Sure, that would work. Thanks ahead of time! There, I just sent you an email! for some reason i like the piano sound soundtrack better than this one. i’m not saying the strings sound is bad though. Yeah, some people enjoy certain instruments moreso than others and that’s just how it goes. In this instance, I do have a greater affinity for piano music, but I think that the violin arrangements were just slightly more solid. Yea I definitely do agree on instrument affinity, which is why I think music is subjected to personal opinion and subjectivity. Still hoping for more arrangements 😀 And hopefully by another guy. They should just get Masashi Hamauzu to do the piano arrangements. Then they’d be overwhemingly amazing. Or if we get a symphonic album out of this, hand the reins over to Hamaguchi. That would generally be easy since it normally means being able to put out more quality pieces than TAMusic. Alas, I have no formal training in composition, so I’d have to decline that unfortunately though I’d love to see the existence of a symphonic anime music doujin scene. Heck, if the anime music doujin scene can be as good as OCRemix, then I’d be in heaven. Those samples were pretty nice. If you’re a fan of string albums/soundtracks, try giving Rule of Rose’s ost a listen if you’re looking for a bit of rustic and mysterious sound. There’s actually one game’s soundtrack that is dominate in stringed instrument. The game is Arcanum and the soundtrack is free of charge to download, as well as the music score for each track! The first sounds familiar and I think I might have read about it over on Rhythmroo and I thought the violin stuff was pretty solid in their dissonance. It does have an interesting modern feel to it for sure. As for the latter, I *think* I’ve touched Arcanum before but I can’t remember. Will grab the soundtrack for sure though.